J-tec has released a unique hands-free materials delivery system to complement the award-winning CarryMore Tugger Cart System used in facilities world-wide. This new automated cart delivery system is now available to the manufacturing and distribution industries. 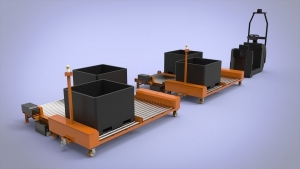 CARRYMATiC smart carts, pulled by tuggers equipped with a CARRYMATiC control module, are delivered to smart lineside stations where they automatically off-load or on-load containers needed at that site. Routes are pre-determined and programmed, requiring only one driver (or no driver if using an AGV) to operate the tugger. The operator, however, does not need to leave the tugger vehicle to complete deliveries. This is truely a hands-free delivery system. The technology to drive accurate delivery and improved loading and unloading comes from the CARRYMATiC master module, located within a facility at a specified location. It “talks” to the CARRYMATiC control modules aboard each smart cart, and syncs to the tugger module monitored by each operator. This wireless technology will work in any environment, and, even with internet signal failures, deliveries can still be manually, electronically completed at each station. This dual system operating design ensures 100% “up” time for each train and is unique to the CARRYMATiC system. This hands-free, no-touch delivery process speeds deliveries and ensures accuracy of delivery placement to the right location, at the right time. It also improves productivity and eliminates the possibility of ergonomic-related stresses from manually loading or unloading carts. In automated mode, using an AGV, operators are not needed to perform deliveries. What am I waiting for? Let’s talk about this!